Lately, I’ve been working on several tutorial videos for my YouTube channel, and while I feel like my videos are helpful, to be most helpful, I need to know what people want to learn. One way I’ve done this is by looking at search terms used to get to my blog or YouTube channel, but most of those are related to content I’ve already produced. So how do I find out what people want to learn? It’s actually quite simple. If you use Google at all, you know that it tries to anticipate what you’re going to search for based on previous and popular searches. So if you want to know what people are searching for, start typing and see what comes up in the search box. For example, if I want to know what people want to learn in Photoshop, all I have to do is type “Photoshop how do I” and see what results pop up, as shown below. So if I want to write or create a Photoshop tutorial, these are great starting points. Other terms to use are “how do you” and “how to” to help guide the search terms. 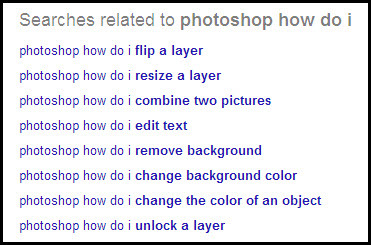 If I want to find out what others want to learn in Adobe Photoshop, I can just type “Photoshop how do I” and let Google do the work for me. For more ideas, press enter to bring up the full search results and when you scroll to the bottom of the page, you will find additional search result suggestions to pull ideas from. Google helps you curate new content based on your topics of interest. Even if you know your audience well, it’s difficult to anticipate all of the topics they’re looking for, so this is a great, easy resource and using this method will help you grow and expand your audience.